A bear trapping permit and a trapping license are required to set a trap for bear. The fee for a bear trapping permit is $27 for residents and $67 for nonresidents. See Trapping License Information. A person is allowed to take one bear by trapping and one bear by hunting annually. See the Summary of Maine Hunting Laws for more information on hunting bear. No more than one trap set for bear is permitted at a time. The only traps allowed when trapping for bear is a cable trap (foot snare), and cage type live trap. The Belisle foot snare is prohibited. When using a cable trap, the trap must have a closing diameter of not less than 2 1/2 inches. Each cable trap must be set at or below ground level in such a manner as to catch the animal only by the foot or leg. All bear traps must be tended at least once each day. Allowing another person to kill or register a bear caught in a trap is not permitted. Continuing to trap for bear after already having killed or registered one in a trap is not permitted. Bears caught in traps must be killed or released and not moved away from the catch site. A bear caught in a trap may not be used in conjunction with a hunt or to train a dog for bear hunting. A line of demarcation of at least 500 yards shall be established at sites permitted or licensed for the disposal of solid waste. A person may not trap within the demarcation area (except that an agent of the Commissioner is exempt for the purpose of live trapping of nuisance bear). The same rules that apply to hunting bears with the use of bait apply to trapping for bears. See the Summary of Maine Hunting Laws about the use of bear baits. MDIFW has adopted an emergency rule that limits some methods used to trap bear which may accidentally capture the federally threatened Canada Lynx in Maine. This emergency rule is effective for the 2018 bear trapping season only. Cable traps (foot snares) that are set and/or designed to capture a bear when it reaches into the device to obtain bait and/or lure are prohibited. These restrictions make the use of bucket-style bear traps and similar devices illegal for the 2018 bear trapping season. Culvert-style traps and other common methods of bear trapping, including the use of trail sets and blind sets that are set in accordance with the emergency rule, are still legal. The Department will develop a permanent rule proposal to be put in place before the 2019 bear trapping season that will address the issue long term. 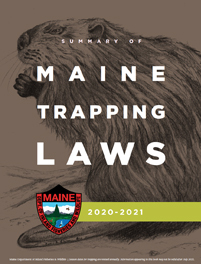 All other rules and laws governing bear trapping, including the limit of one bear trap per person and the minimum closing diameter for cable traps, remain in effect.